We know the trends in smartphones for 2017: dual cameras, bezel-less designs, and HDR displays. But there's one highly desirable feature that always seems to be just beyond the capabilities of today's handset manufacturers, and that's flexible, bendy, foldable phones. 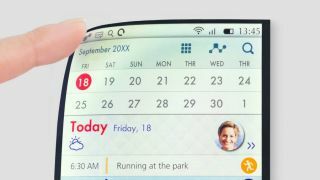 Rumors of flexible screens are everywhere. Will the Samsung Galaxy X have a foldable 4K display? Will Apple use a foldable OLED display on the next iPhone? Of course, we've been here before in a basic (read: underwhelming) sense, with Samsung's contoured Galaxy Round and LG's G Flex and G Flex 2 phones from a few years ago. But there's more to this even than shape-shifting smartphones. “In the short term we’re looking at phones, TVs, tablets and wearables such as smart watches,” says Jack Wetherill, Senior Market Analyst at Futuresource Consulting. In fact, so many prototypes of flexible TVs, wearables and watches are emerging that it now seems certain we're on the cusp of a flexible future. So who will unveil the first truly flexible product? Not surprisingly, flexible displays are likely to come first from South Korea, and the smart money is on either LG or Samsung. Starting big, LG just demoed its 65-inch Flexible Open Frame OLEDs at the ISE 2017 event in Amsterdam in February. OLED technology has a distinct advantage in creating flexible screens because it's so thin, but the Flexible Open Frame OLEDs (4K resolution, of course) can be bent into either convex or concave shapes to fit any environment. LG Displays has also shown off its rollable, flexible and even transparent panels and tablets before. "They are beautiful things to see,” says Wetherill of LG’s proof-of-concept rollable, flexible displays. Terms like bendable and foldable are used interchangeably when discussing flexible displays, but they're drastically different. A bendable display is the least ambitious; it simply flexes between your fingers. Such displays are what have arguably already been created; they're just not on sale yet. “Manufacturing processes for bendy OLED displays are built into some smartwatches and smartphones already, but at the moment you can’t flex or bend them,” says Wetherill. Since they already have an OLED layer beneath the glass that's already made using plastic, lots of gadgets are therefore almost ready to bend. “If you have a bendy screen product in your pocket it just won’t break as easily, adds Wetherill. This is all about ditching glass to make gadgets both lighter and safer. China's Royole recently talked up its 0.01mm-thin FlexPhone that bends enough to wrap around a wrist. After a few bendy phones likely launch in 2018, further down the pipeline will come foldable and rollable phones. This is where the concept of flexible displays starts to impress. Samsung is reportedly working on a foldable phone – possibly called the Samsung Galaxy X – that uses some kind of hinge. It will almost certainly be based around Samsung's AMOLED display tech. It is possible to make LCD displays flex, but OLED is easier. Although it seems unlikely to happen before 2018, LG seems intent on producing what it calls 'out-foldable' OLED displays for Apple, but also for Google and Microsoft. However, LG could choose to focus on making displays for its own products if the LG G6 manages to resurrect its smartphone business. But there's more innovation ahead. “The next stage is when the user can roll up a screen and carry it around, which may have business applications,” says Wetherill. One example might be in industry and engineering, where a mechanic has to go onto an aeroplane or into a factory to fix a problem, but needs to consult vast manuals. “A tablet is too small, so rolling out a big display may have advantages, and there could even be lots of small-screen devices that could be rolled out to become a bigger device,” says Wetherill. He predicts these types of flexible screens could appear sometime in the 2020s. An Apple iScroll, anyone? Making a display bend, fold or flex means using completely new components with some 'give' in them. Moving away from its tough Gorilla Glass for phones like the Sony Xperia XZ Premium, Corning's new Willow Glass is ultra-thin and flexible, but the flexible future will be owned by plastic substrates and plastic… everything. Showing at MWC 2017 in Barcelona in late February was a 12.1-inch organic LCD (OLCD) on plastic, which uses organic transistors on a plastic sheet. It's 10 times lighter than conventional glass-based displays and can go much, much larger. “While LCD is the dominant and trusted display technology in the market today, glass-based LCDs can’t deliver the conformability, robustness and thinness requirements in new applications we are seeing across many sectors including automotive, consumer electronics and wearables," said Chuck Milligan, CEO of FlexEnable. The company is working with display manufacturers in Asia to support the transfer of its OLCD platform into conventional flat panel display lines. At the same event, FlexEnable also showed off the latest version of its wearable, 0.3mm-thin, 4.7-inch OLCD as a smart watch – although it could just as easily be a phone – which we've reported on before; this new version has a touch sensor and plays video. It also showed a flexible, plastic e-reader. Flexible screens also require flexible components, and near FlexEnable's demos at the MWC 2017 were some candidates. AMO and RWTH Aachen University showed tiny, flat and flexible WiFi, Bluetooth, and cellular (potentially even 5G) antennae that used graphene inks, as did Graphene Security's completely flat RFID chips, which enable contactless payments, using graphene-based antennae. Even stretchable OLED circuits are on the horizon; researchers from Michigan State University (MSU) recently developed a stretchable circuit that includes an OLED display, using inks to produce the circuits, the substrate and the organic elements. The scientists claims that the breakthrough could make the costs of producing flexible electronics as low as that to print newspapers. By turning to flexible, even printable components, portable electronics of all kinds could be about to smash through their glass ceiling and embrace a plastic future.